Be the first to review this 2019 Subaru Legacy. 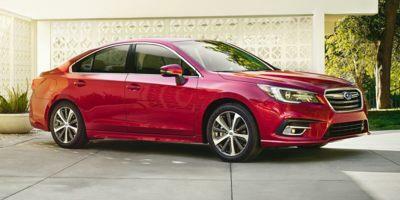 If a Subaru is tempting, but the Impreza sedan isn’t quite sizable enough, Subaru has a larger alternative that might fill the bill. Occupying a spot in the lineup for almost three decades, the midsize Legacy was last redesigned for a sixth generation, as a 2015 model. With the 2019 Legacy, Subaru has focused on safety to make its four-door sedan even more compelling. Previously optional, the company’s EyeSight group of driver-assist technology is now standard on all Legacy models. A 6.5-inch touchscreen goes into base models. The Sport edition adds blind-spot monitoring and lane-changer assist, with rear cross-traffic alert. Upper trim levels get an auto-dimming compass mirror. Each Legacy is manufactured in Indiana. Subaru offers the Legacy sedan in base, Premium, Sport, and Limited trim levels. Most versions contain a 2.5-liter flat (horizontally-opposed) four-cylinder engine that makes 175 horsepower and 174 pound-feet of torque. Limited trim is available with the four-cylinder or a flat 3.6-liter six-cylinder engine, developing 256 horsepower and 247 pound-feet. Both engines mate with a continuously variable transmission (CVT) and standard all-wheel drive - which has been a long-time Subaru hallmark. A manual mode is incorporate into the CVT, with paddle shifters than can select from a series of simulated gear ratios when accelerating assertively. Making its “EyeSight” driver-assist package standard on all Legacy models has raised its stature on the safety front. All Legacy sedans now include automatic emergency braking, active lane control, and adaptive cruise control. Blind-spot monitoring is standard on Limited trim and optional for all but the base Legacy. Some advanced safety features remain absent, but those are typically found only on more costly vehicles. Federal and independent testers have given the Legacy admirable crash-test ratings. The National Highway Traffic Safety Administration gives the 2019 Legacy five-star ratings across the board: overall and for frontal and side impacts, as well as for rollover resistance. The latter is a calculated figure, not derived from a test, and few vehicles are awarded five stars. The Insurance Institute for Highway Safety has deemed the 2018 Legacy a Top Safety Pick+, earning “Good” scores in each crash-test. Frontal crash prevention has been rated “Superior,” provided that specified safety equipment is installed. Halogen headlights in lower trim levels were deemed "Marginal," but LED headlights on the Limited edition were rated "Good." Prices do not include $885 destination charge. Base 2.5i ($22,545) holds a four-cylinder engine with CVT and all-wheel drive, along with a 6.5-inch touchscreen, Apple CarPlay and Android Auto, rearview camera, EyeSight safety technology, and 17-inch steel wheels. Alloy wheels add $350. 2.5i Premium ($24,695) adds alloy wheels, a 10-way power driver’s seat, heated front seats, an 8.0-inch touchscreen, dual-zone automatic climate control, auto-dimming mirror, and a leather-wrapped steering wheel. 2.5i Sport ($26,795) features distinctive styling and 18-inch wheels, as well as blind-spot monitoring with lane-change assist. Navigation, a moonroof, and reverse automatic braking are optional. 2.5i Limited ($29,245) features leather-trimmed seats, heated rear seats, and Harman Kardon audio. Automatic high-beam headlights, navigation, and a moonroof come in a $2,150 option package. 3.6R Limited ($31,545) upgrades Limited trim to a 3.6-liter six-cylinder engine. An $850 option package includes blind-spot monitoring with rear cross-traffic alert. Gazing at a Legacy isn’t likely to induce spasms of adoration. Design work qualifies as average, rather than special. In stark contrast to its Outback wagon sibling, the Legacy lacks discernible personality. Perhaps the best that can be said is that’s inoffensive. Body lines are clean, but those who penned the Legacy don’t appear to have stretched the styling limits very far. Helped by fancier wheels, Sport and Limited trim levels do seem almost upscale. Conversely, the base model’s 17-inch steel wheels exude a downscale vibe. Roomy and comfortable, the Legacy cabin has ample space for five passengers. Considering its moderate price, the interior conveys an upscale feel. Seats are helpfully supportive for long-distance journeys, courtesy of uncommonly long cushions. Except for the base model, each Legacy has a 10-way power driver’s seat. The power seat in Limited trim lacks height adjustment. Rear-seat riders benefit from abundant stretch-out space. In addition, the Legacy is wide enough to accommodate three occupants in the 60/40-split back seat. Dashboard design is convenient, if uninspired, shunning the angular look that many competitors have favored. A 6.5-inch touchscreen for infotainment is standard in the base model, but most versions use an 8.0-inch touchscreen, with available navigation. Touchscreens sit high, with most controls grouped either below or to the left of the steering wheel. Apple CarPlay and Android Auto are standard. Most trim levels are upholstered in simple beige and gray cloth, but Sport models use mesh-like fabric. Contrasting stitching decorates the dashboards of all except the base model. Fabric upholstery has a good feel, but the leather employed in Limited versions isn’t especially soft. All-wheel drive inevitably limits trunk space, but at 15 cubic feet, the Legacy’s luggage compartment ranks with Toyota’s Camry. There may be little to get excited about, but that’s not the Legacy’s purpose. Rather than conveying motoring delight, this midsize simply proceeds with its tasks, providing a welcome sense of confidence. Sedate and smooth-riding, suffering little road noise, Subaru’s larger sedan manages to emulate a luxury car, without demanding a lofty price. Tracking adeptly in straight-line highway driving, the Legacy easily settles into an easygoing, comfortable cruise. Linear, direct steering combines with ample road grip to keep the Legacy well-planted even when the pavement turns twisty. Sport-trim suspensions are no different from those on other Legacy sedans. Performance is indisputably on the light side. Around town, at least, the standard four-cylinder engine provides adequate response, stimulated by curiously snappy reactions to the gas pedal. Highway passing is markedly more challenging. Picking the six-cylinder alternative certainly boosts performance, but the difference is paid for at the gas pump. Simulated gear ratios, selected by paddles, help make the CVT feel like a conventional automatic transmission. All-wheel drive helps the Legacy feel sure-footed on any surface. Even with standard AWD, the base engine promises decent fuel economy, EPA-rated at 25/34 mpg City/Highway, or 29 mpg Combined. The six-cylinder engine demolishes those estimates, sinking to a far-from-frugal 20/28/23 mpg. All Legacy sedans use regular gasoline. With the Legacy, Subaru offers all-season confidence and plenty of value. Few are likely to swoon over its design or performance, but this lesser-known sedan is tough to beat for safety and comfort, at a reasonable price. Well-equipped for its category, the Legacy manages to do nearly everything right. In Limited trim, it comes across as practically luxurious. 2019 Subaru listings within 25 miles of your ZIP code. Find 2019 Subaru listings for sale near you.